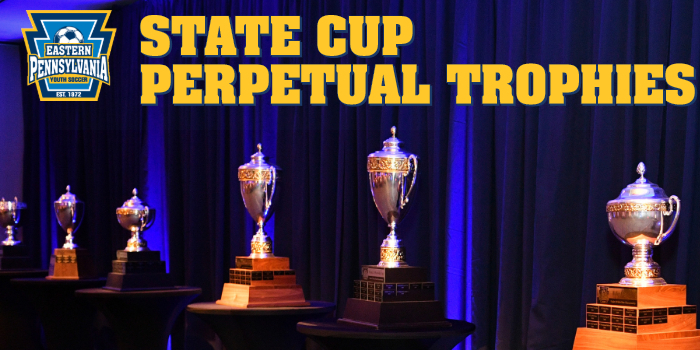 In the spirit of legacy trophies like the FA Cup, Stanley Cup and James P. McGuire Cup, Eastern Pennsylvania Youth Soccer introduced perpetual trophies to its State Cup in 2016. Since then, thousands of youth players have competed for trophies named for Eastern Pennsylvania Youth Soccer luminaries who embodied the mission of the state association to promote and facilitate the game of soccer for all youth at all levels of play in eastern Pennsylvania. The U17 Boys Cup recognizes Eastern Pennsylvania Youth Soccer’s longest tenured board member, Frank J. Olszewski. A Lehigh County native, Olszewski was a driving force behind bringing a soccer complex to the Lehigh Valley, known today as the Lehigh County Fields. He served as the District 6 commissioner, Vice President of Travel and was the only individual to assume the role of Executive Vice President of the association. In addition to his leadership within the state association, Olszewski was a well-respected USSF Level 6 referee, and often officiated club, high school and college matches. He also held a USSF National C Coaching License. Olszewski received Eastern Pennsylvania Youth Soccer’s highest honor, the Service to Youth Award in 2004. In 2009, he was inducted into the Lehigh Valley Hall of Fame for his efforts to grow the game. A tireless advocate for girls soccer, Charlotte Moran was recognized in 2016 with the naming of the U17 Girls Eastern Pennsylvania Youth Soccer Charlotte Moran Cup. She was best known for her work with the girl’s side of the Olympic Development Program (ODP) in Region I and US Youth Soccer. Moran served as the Region I Girls ODP Administrator for 12 years and held the same position with Eastern Pennsylvania Youth Soccer for 17 years. She also served as the National Chair for four years of the US Youth Soccer Girls ODP Committee. Moran was the executive director of our state association while also chairing the Women’s Committee for U.S. Soccer. In 2014, Moran was inducted into the US Youth Soccer Hall of Fame. A soccer pioneer in the United States, Werner Fricker paved the way for the growth of the game throughout his life as a player and later as an administrator with U.S. Soccer. An immigrant to the United States in 1952, Fricker captained the Philadelphia German-Hungarians team that went on to win the 1965 U.S. Amateur Cup. He also represented the United States on the team that vied for a spot in the 1964 Olympics. Fricker helped to found Eastern Pennsylvania Youth Soccer in 1972 and served as the association’s president for two years. During his tenure with U.S. Soccer, Fricker led the successful bid to host the FIFA World Cup in 1994, and served as president, vice president and executive vice president of the federation for a combined 16 years. He was instrumental in establishing the Women’s National Team, and the Under-20 and Under-17 Men’s National Team programs. In addition to being inducted into the National Soccer Hall of Fame and the USASA Hall of Fame, U.S. Soccer named its top accolade, the Werner Fricker Builder Award, in his honor in 2002. Known as Delaware County’s “Mr. Soccer,” Robert Urban worked extensively at the club and state level to grow the game. A U.S. Naval Academy graduate and World War II Veteran, Urban helped to expand Nether Providence AA Soccer from 100 to 1,500 registered players over three decades. He served as a board member and later president of the Delaware County Soccer League, and volunteered his time as camps administrator with Eastern Pennsylvania Youth Soccer. In 2002, the Philadelphia Union honored Urban with the Hometown Hero award, for his dedication to protect and serve our country. Eastern Pennsylvania Youth Soccer was proud to honor Urban in 2016 with the naming of the U16 Girls Robert Urban Cup. A Bucks County native, Richard Groff recognized the power of our sport as a player and coach and worked tirelessly to help grow the game in America. Groff was instrumental in promoting the U.S. Men’s National Team games, and brought the team to Philadelphia to play in front of 43,000 fans at Franklin Field in 1989. He served as treasurer for U.S. Soccer in the early 1990s, and was an advocate for the women’s side, helping to launch the inaugural Chiquita Cup International Women’s Tournament. In 1994 Groff was named commissioner of the American Professional Soccer League, helping to build the USL, the second tier of American professional soccer. Most recently, he served as the president of the U.S. Adult Soccer Association (2010-2014), and in 2014 received U.S. Soccer’s most prestigious honor, the Werner Fricker Builder Award. Betty D’Anjolell, a Lansdowne native, was a key figure in establishing women’s soccer both in Pennsylvania and the United States as a whole. D'Anjolell began as a coach and later became president of the Lansdowne Girls Club and took on a leadership role with Eastern Pennsylvania Youth Soccer. In the early 1980’s, D’Anjolell worked to get women’s soccer accepted by the U.S. Olympic Committee, which led to the creation of the U.S. Women's National Team. The USWNT played its first match in 1985 and six years later won the inaugural Women’s World Cup. During this time, D’Anjolell served as the national chairperson of the U.S. Youth Soccer Girls Olympic Development Program. In 1995, D’Anjolell became the first female vice president in the history of MLS, when she joined D.C. United as vice president of operations, a role she held until 1998. She was named MLS Executive of the Year in 1997 as D.C. United won its second consecutive MLS Cup. Recognizing the benefits younger players receive from experiencing top-level competition and the demand created for more opportunities, the US Youth Soccer Board of Directors voted to add the 14-and-Under age group to the 2001 US Youth Soccer National Championships. 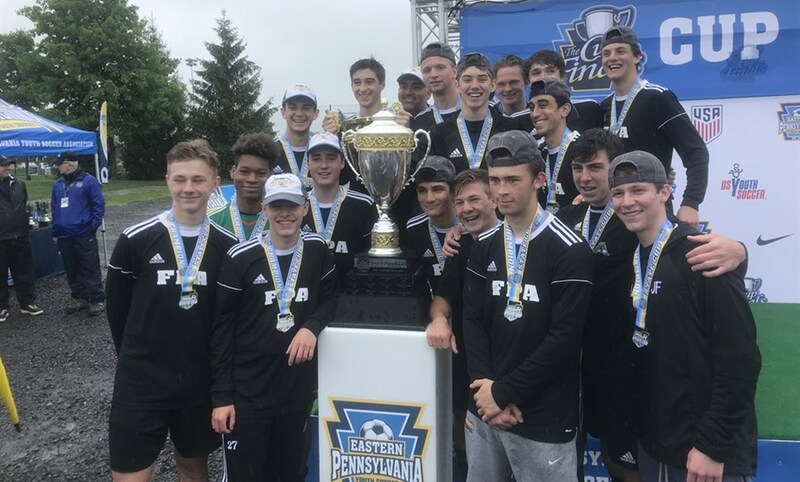 Since then, two Eastern Pennsylvania Youth Soccer teams have competed at the National Championships in the age group: Lehigh Valley United in 2010 and Penn Fusion in 2013. The U14 Boys trophy was introduced in 2018. 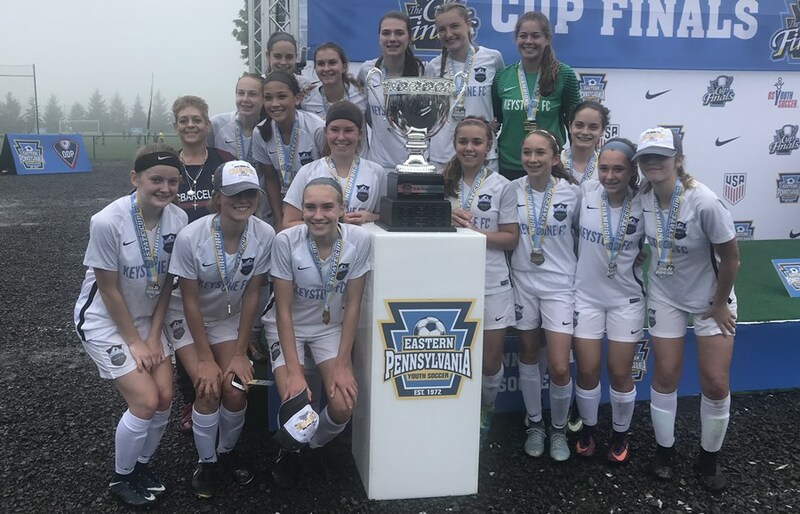 Eastern Pennsylvania Youth Soccer U14 Girls teams have been among the state association's most successful in the US Youth Soccer National Championship Series. Since 2000, six clubs have claimed US Youth Soccer Region I championships: Langhorne Strikers (2000), FC Delco Fusion (2003), Hershey Attack (2006), YMS Premier Xplosion (2013) and Philadelphia Soccer Club Coppa Swarm (2018). 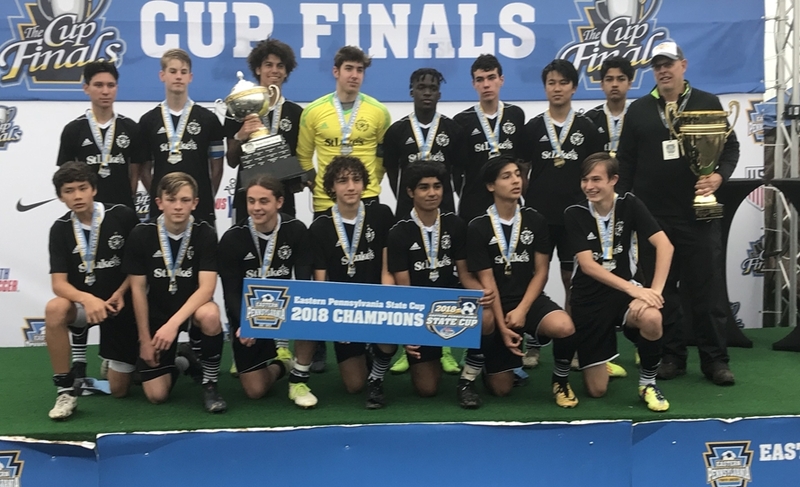 Coppa Swarm, the 2018 Eastern Pennsylvania State Cup U14 champions, finished second in the nation. The U14 Girls trophy was introduced in 2018.